The patented pivoting folding temple (PFT) system allows the arms of the glasses to rotate and collapse completely flat. 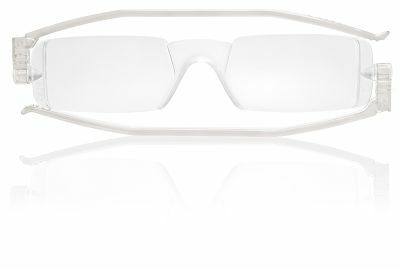 These innovative awarding winning glasses weigh just 12 grams and fit into a 10mm thin tough polypropylene case that can be slipped into a shirt pocket, a handbag or the glove box. Available in 6 colours and 5 dioptric powers: +1.00, +1.50, +2.00, +2.50, +3.00. Carry case included.